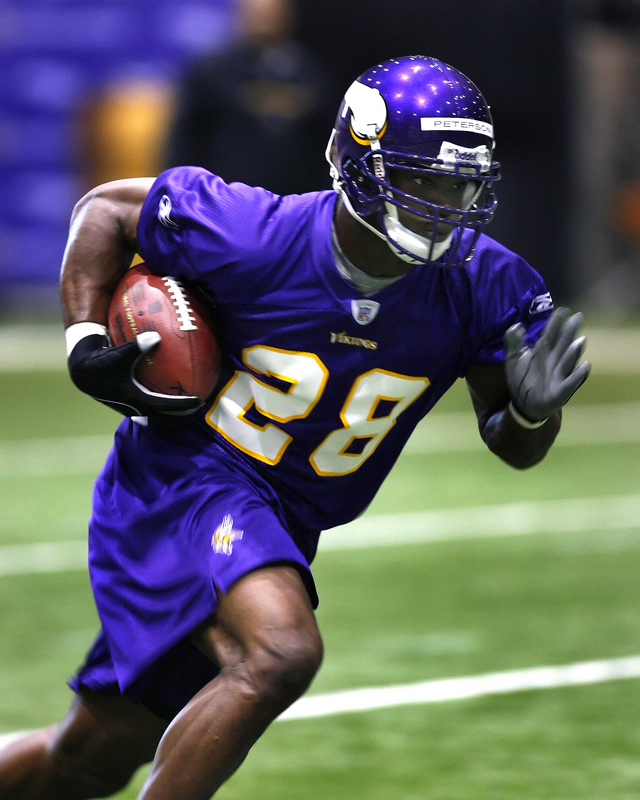 Adrian Peterson is the star running back for the Minnesota Vikings and has been one of the top backs in the league since he was picked seventh overall in the 2007 NFL draft. Peterson was going in the 3rd to 5th round of most redraft leagues last year, mainly because people assumed he would be splitting time with Chester Taylor, and because Brad Childress had announced that Taylor would start the season as the Vikings’ starting running back. That means Adrian Peterson was a major factor in fantasy football last year, helping a whole lot of teams across the nation make their local league’s playoffs. When a player who went in the 4th round is the consensus second overall selection the next year, then those teams who drafted him in the 4th essentially got one more 1st round selection than other teams in the league. That being said, most of the reasons Adrian Peterson fell last year are still concerns. One, Chester Taylor is certain to take a significant amount of carries away from AP. Two, the Minnesota Vikings offense is still led by a young quarterback, Tarvaris Jackson, who has yet to show he can consistently produce in the NFL. Three, Adrian Peterson showed late in the season that injuries are not a thing of the past. In fact, AP’s lack of production in three of the last four NFL regular season games probably cost a lot of owners their league title. Fantasy football is about projecting this year’s stats — not slavishly going by last year’s numbers. So it’s about right to project Adrian Peterson into the top two runners, given his stats had him in the top three last year. But I think it’s crazy to draft Adrian Peterson if LaDainian Tomlinson is still on the board. Peterson attended Oklahoma and set NCAA freshman records for rushing with 1925 yards and 339 carries. His sophomore year was hampered by an injury to his ankle in the first big twelve conference game against Kansas State University. Despite this he still ran for 1,208 yards with 220 carries and fourteen touchdowns. 2006 marked the final college season for Peterson. He broke his collar bone during a game against Iowa State leaving him just 150 yards shy of surpassing Billy Sims Oklahoma rushing record. He played in his final game for the Sooners against Boise State in the Fiesta Bowl and ran for 77 yards, he needed only 74 more to surpass the record. Peterson declared on January 15, 2007 that he would not attend Oklahoma his senior year and would enter the 200 NFL draft. The numbers where there for all to see and all new of the talent, but the only hindrance for Peterson was his proneness to injury. Peterson started twenty two out of thirty one games for the Oklahoma Sooners and had fairly minor but significant injuries in his collegiate career. Dislocated shoulder, high ankle sprain, and a broken collar bone were all in the mix for him. Several scouts touted him as the new Eric Dickerson, while the skepticism because of injury was kept at the forefront leading up to the draft. 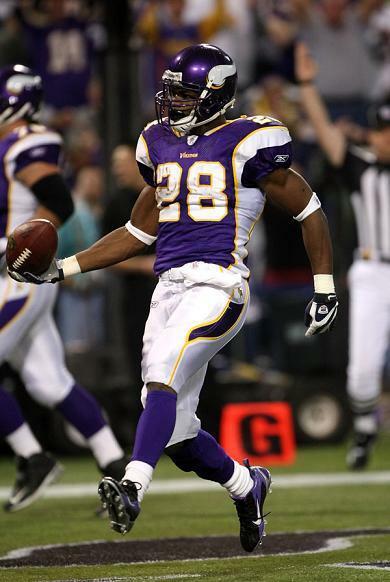 On April 28, 2007 Peterson was the first running back to be picked that year, he went seventh overall, picked by the Minnesota Vikings. Six teams had passed on the guy whom most thought was the most talented player in the draft, mainly because these teams had more pressing needs, already had a star running back or were concerned about AP’s injury history. The Vikings, despite having signed RB Chester Taylor to a large free agent contract the previous year, decided Adrian Peterson was too talented to pass up — that he would be a franchise running back. His rookie year with the Vikings was something to be exited about. We got to see a star in the making, actually it was more like a star busting on to the scene. It was easy to see his exceptional running ability early on, but come the October 14th game against the Chicago Bears and that�s when you knew he had the makings of being a great. Setting a franchise record of 224 yards rushing with 20 carries and three touchdowns the game was a blinder. He also set a NFL record for all purpose yards by a rookie with 361. Sports journalist, fans, and neutrals alike were salivating at the prospect of the new kid with so much time ahead of him. Just a few weeks later he was at it again against the Chargers breaking his won records. Despite an injury to his lateral collateral ligament that kept him out for a month he finished the season strong with a great showing at the pro bowl game. Anyone who dispelled the heavy talk of him being injury prone to pick him for there fantasy team last year were all but crying with joy seeing his numbers. If the Minnesota passing game starts producing more then his numbers can go from excellent to outrageous. If it�s any indication of the talent we are talking about, this guy just came off what would be for nearly any players a career high, but here we are talking about how he can improve. Scary isn�t it? At the same time he is still somewhat of an injury risk. Then you have Chester Taylor in the background. Though Peterson is vastly more talented than Taylor, he will take carries away from Peterson. If Tarvaris Jackson fails to improve then teams will stack the box against the Vikings to keep Peterson from delivering. In the end, he should be up there at the top end in every fantasy league, probably as the first or second pick everywhere. Peterson has shown he can post huge numbers without a good passing game, so if the Vikings improve in that aspect of the game, it should give Adrian Peterson more running room. The Vikings offensive line is one of the top in the league, so the bottom line is if he stays off the medical table he will most likely have another stellar year. Bernard Berrian, a big play threat at wide receiver, was brought over from the Chicago Bears. Sidney Rice showed flashes in his rookie season, as well, so the Vikings could threaten defenses with the deep ball this year, opening up running lanes. Also, the Vikings added Jared Allen in a trade with the Kansas City Chiefs. Allen led the league in sacks last year, despite missing the first two games of the season on suspension. The Minnesota Vikings defense, led by defensive tackles Pat Williams and Kevin Williams, have led the league in rushing defense (giving up the least amount of rushing yards) the past two seasons. This has caused teams to throw the ball a whole lot more, so the addition of Jared Allen patches one of the biggest holes on the Minnesota Vikings’ roster. The Vikings should have one of the best defensive lines in football next year. They should also be able to punish teams when they try to throw against the Vikings. This probably means that Adrian Peterson and the Minnesota Vikings offense should have the ball for more minutes this year, and should have the ball with the lead more often. Both of these factors should help Peterson’s numbers. Well, if you have the #1 pick, draft Adrian Peterson. If you don’t want to draft Adrian Peterson, then I would suggest you trade the pick to someone who does. Given the fact that the next 6-8 running backs are all about the same to me, with their strengths and weaknesses, I would suggest you slide down to the middle of the draft and pick up an extra high round selection or two – if that’s allowed in your league. Adrian Peterson is clearly the #1 selection this year, though. AP is only in his third year. He has a good defense and a good offensive line in front of him. While his quarterback situation isn’t the best with Sage Rosenfels and Tavaris Jackson, I’m guessing Rosenfels becomes the starter in Minnesota to start the season and does better than you would expect. The Minnesota Vikings have one of the easiest schedules against passing defenses this year. The fact is, Adrian Peterson has shown his fantasy football pedigree for two seasons, while players like Matt Forte and DeAngelo Williams still have to prove they can do it two years in a row. With Brian Westbrook and LaDainian Tomlinson 30 now and both dealing with the injuries that happen to 30-year old running backs, there’s no one besides Adrian Peterson who fits the role of #1 overall fantasy football pick. So take Adrian Peterson if you have (and keep) the #1 overall pick. Running backs are so important in fantasy football that Adrian Peterson is a no-brainer Top 3 pick. He finished in the Top 3 among most fantasy runners last year, usually behind LaDainian Tomlinson and Brian Westbrook. Given that he’s five or more years younger than those two players at a position where youth is a premium, and I can see why Peterson is a top 2 pick this year. That being said, I still wonder how durable Adrian Peterson will be in the NFL. He definitely wore down at the end of last season, adding zero fantasy points twice (in most systems) in the last six weeks of the NFL season and collecting less than 40 yards two other times. So take LT if you have the chance, because Tomlinson has shown he can be depended on week-in, week-out for years now. But if you have the 2nd pick in the draft and Adrian Peterson is available, I wouldn’t blame you if you grab the young, trendy running back.